Preparation: Scrub with your fingers or a brush under running water. Peel if desired. Green potatoes and potato sprouts are high in the alkaloid solanine, which can be toxic if eaten in large quantities. Green potatoes should not be eaten and sprouts on any potatoes should be removed before cooking. 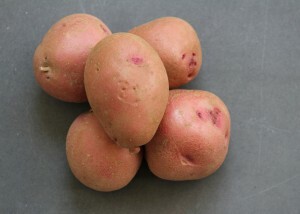 Nutritional Benefits: Potatoes are very energizing vegetables, as they are high in carbohydrates. They are also loaded with vitamins and minerals including potassium (for cardiac and nervous system support), niacin (for heart health), Potatoes provide an energizing supply of carbohydrates, as well as important vitamins and minerals, including potassium, niacin, vitamins B6 (for metabolic function), and vitamin c (for immunity). Eat them with the skins to boost fiber intake.